It's always something with diabetes, isn't it? You take such good care of your diabetic cat. Kitty gets his insulin shots and his special food right on time each day. Unfortunately, diabetes is an insidious disease. No matter how well you care for Kitty, he could experience complications. Early detection can make a difference. The cat's pancreas produces insulin, a hormone regulating glucose in the body. When the pancreas stops producing insulin or the amount produced is inefficient, Kitty's body begins the breakdown of stored protein and fat to use in the body. High levels of sugar in his system leads to frequent peeing. If your cat was diagnosed with diabetes, you probably brought him to the vet because he lost weight, was always hungry and thirsty and flooded the litter box. Cats with diabetes are either insulin-dependent, meaning they require daily or more frequent injections of insulin, or non-insulin dependent, meaning the disease is manageable without insulin shots. If your diabetic cat exhibits problems with his rear legs or begins walking oddly, take him to the vet as soon as possible. He could be suffering from feline diabetic neuropathy, probably the most frequently seen complication in diabetic felines. 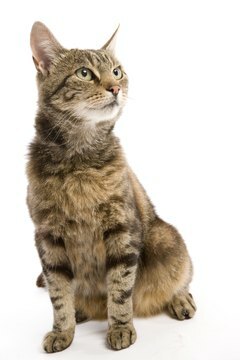 Feline diabetic neuropathy occurs because of the degeneration of certain nerves. Instead of moving normally, Kitty might seem stuck in a crouching position. As the problems spreads, it can affect Kitty's front legs and other body parts. Your vet might adjust his insulin dose, along with supplementation with a type of vitamin B12 called methylcobalamin, to help reverse the course of the neuropathy. Hypoglycemia is the term for low-blood sugar, occurring when Kitty receives too much insulin. If Kitty appears weak, becomes uncoordinated or starts convulsing, it's a red-alert and he must get to the vet. In the meantime, see if he'll eat his normal food. If he's too out of it to eat, rub a little corn syrup on his gums or syringe it into his mouth. Dr. Gary D. Norsworthy, writing in Veterinary Practice News, states that the main cause of death in diabetic cats is euthanasia. If you've been caring for Kitty, you know the time commitment and responsibility involved. Much of your life revolves around ensuring your beloved cat gets his shots and food at particular times and is constantly monitored. If you can't do it on a particular day, you must find someone else willing and able to fill in. Caring for Kitty means you've probably had to pass on some social invitations, or cut them short. Going on vacation or out of town on business requires more than just finding someone to come by and feed the cat and change the litter once a day. Not everyone can care for a diabetic cat. It's often a matter of work and other schedules. Does Insulin Cause Excessive Hunger in Cats?